Emperor Haile Selassie I (born Lij Tafari Makonnen Ge'ez, Amh. pronounciation lij teferī mekōnnin, July 23, 1892 – August 27, 1975) was de jure Emperor of Ethiopia from 1930 to 1974 and de facto from 1916 to 1936 and 1941 to 1974. His full set of titles was: "His Imperial Majesty Haile Selassie I, Conquering Lion of the Tribe of Judah, King of Kings and Elect of God," girmawi qedamawi 'atse hayille sillasie, mō'a 'anbassā za'imnaggada yīhūda nigūsa nagast za'ītyōṗṗyā, siyūma 'igzī'a'bihēr). His name means "power of the Trinity." Selassie's reputation outside Ethiopia was different from that within. To the outside world, he was heir of an ancient dynasty possibly descended from Solomon, and in his later years he enjoyed ceremonial precedence as one of the most senior heads of state. His nation was the only African state to have evaded colonization. To many of his own subjects, however, he was an autocratic ruler who failed to respond to the needs of his people. Early in his life he introduced constitutional and modernizing reforms, but later, in the years preceding his removal from power on September 12, 1974, he was much more neglectful of the country's welfare. In particular, he failed to take measures to counter the effects of a severe famine even as he celebrated his 80th birthday amidst pomp and ceremony. (Some assert in his defense that he may not have been informed about the extent of the famine.) During World War II, Selassie was in exile due to Italian occupation. Later in his life, Marxist ideology played a significant and destabilizing role in Ethiopian politics that ultimately resulted in his downfall. Mengistu Haile Mariam, who deposed him, established a one-party communist state that subsequently received considerable aid from the Soviet Union. Among members of the Rastafari movement Haile Selassie I is considered to be God incarnate, who is still living somewhere, and who continues to bear the full set of titles earlier accorded him by others. Haile Selassie I was born Tafari Makonnen on July 23, 1892, in the village of Ejersa Goro, in the Harar province of Ethiopia, as Lij (literally "child", usually bestowed upon nobility). His father was Ras Makonnen Woldemikael Gudessa, the governor of Harar, and his mother was Weyziro (Lady) Yeshimebet Ali Abajifar. He inherited his imperial blood through his paternal grandmother, Princess Tenagnework Sahle Selassie, who was an aunt of Emperor Menelik II, and as such, claimed to be a direct descendant of Makeda, the queen of Sheba, and King Solomon of ancient Israel. Emperor Haile Selassie I had an elder half-brother, Dejazmach Yilma Makonnen, who preceded him as governor of Harar, but died not long after taking office. Tafari became a Dejazmach, or commander of the troops, at age thirteen. Shortly after, his father Ras Makonnen died at Kulibi. Although it seems that his father had wanted him to inherit his position of governor of Harar, Emperor Menelik found it imprudent to appoint such a young boy to this important position. Dejazmach Tafari's older half-brother, Dejazmach Yilma Makonnen was made governor of Harar instead. Tafari was given the titular governorship of Sellale, although he did not administer the district directly. In 1907, he was appointed governor over part of the province of Sidamo. Following the death of his brother Dejazmach Yilma, Harar was granted to Menelik's loyal general, Dejazmach Balcha Saffo. However, the Dejazmach's time in Harar was not successful, and so during the last illness of Menelik II, and the brief tenure in power of Empress Taitu Bitul, Tafari Makonnen was made governor of Harar, and entered the city April 11, 1911. On August 3 of that year, he married Menen Asfaw of Ambassel, the niece of the heir to the throne, Lij Iyasu. Although Dejazmach Tafari played only a minor role in the movement that deposed Lij Iyasu on September 27, 1916, he was its ultimate beneficiary. The primary powers behind the move were the conservatives led by Fitawrari Habte Giorgis Dinagde, Menelik II's long time war minister. Dejazmach Tafari was included in order to get the progressive elements of the nobility behind the movement, as Lij Iyasu was no longer regarded as the progressives' best hope for change. However, Iyasu's increasing flirtation with Islam, his disrespectful attitude to the nobles of his grandfather Menelik II, as well as his scandalous behavior in general, not only outraged the conservative power-brokers of the Empire, but alienated the progressive elements as well. This led to the deposition of Iyasu on grounds of conversion to Islam, and the proclamation of Menelik II's daughter (Iyasu's aunt) as Empress Zewditu. Dejazmatch Tafari Makonnen was elevated to the rank of Ras, and was made heir apparent. In the power arrangement that followed, Tafari accepted the role of Regent (Inderase), and became the de facto ruler of the Ethiopian Empire. As Regent, the new Crown Prince developed the policy of careful modernization initiated by Menelik II, securing Ethiopia's admission to the League of Nations in 1923, abolishing slavery in the empire in 1924. He engaged in a tour of Europe that same year, inspecting schools, hospitals, factories, and churches; this left such an impression on the future emperor that he devoted over forty pages of his autobiography to the details of his European journey. Empress Zewditu crowned him as negus ("king", in Amharic) in 1928, under pressure from the progressive party, following a failed attempt to remove him from power by the conservative elements. The crowning of Tafari Makonnen was very controversial, as he occupied the same immediate territory as the Empress, rather than going off to one of the regional areas traditionally known as Kingdoms within the Empire. Two monarchs, even with one being the vassal and the other the Emperor (in this case Empress), had never occupied the same location as their seat in Ethiopian history. Attempts to redress this "insult" to the dignity of the Empress' crown were attempted by conservatives including Dejazmatch Balcha and others. The rebellion of Ras Gugsa Wele, husband of the Empress, was also in this spirit. He marched from his governorate at Gondar towards Addis Ababa but was defeated and killed at the Battle of Anchiem on March 31, 1930. News of Ras Gugsa's defeat and death had hardly spread through Addis Ababa, when the Empress died suddenly on April 2, 1930. Although it was long rumored that the Empress was poisoned upon the defeat of her husband, or alternately, that she collapsed upon hearing of his death and died herself, it has since been documented that the Empress had succumbed to an intense flu-like fever and complications from diabetes. Following the Empress Zewditu's sudden death, Tafari Makonnen was made Emperor and proclaimed Neguse Negest ze-'Ityopp'ya ("King of Kings of Ethiopia"). He was crowned on November 2 as Emperor Haile Selassie I at Addis Ababa's Cathedral of St. George, in front of representatives from 12 countries. (Haile Selassie had been the baptismal name given to Tafari at his christening as an infant meaning "Power of the Holy Trinity.") The representatives included Prince Henry, Duke of Gloucester (son of British King George V, and brother to Kings Edward VIII, and George VI), Marshal Franchet d'Esperey of France, and the Prince of Udine representing Italy. Upon his coronation as emperor and in keeping with the traditions of the Solomonic dynasty that had reigned in highland Abyssinia since 1297, Haile Selassie's throne name and title were joined to the imperial motto, so that all court documents and seals bore the inscription: "The Lion of the Tribe of Judah has conquered! Haile Selassie I, Elect of God King of Kings of Ethiopia." The use of this formula dates to the dynasty's Solomonic origins, all monarchs being required to trace their lineage back to Menelik I, who in the Ethiopian tradition was the offspring of Solomon and the Queen of Sheba. By Empress Menen, the Emperor had six children: Princess Tenagnework, Crown Prince Asfaw Wossen, Princess Tsehai, Princess Zenebework, Prince Makonnen and Prince Sahle Selassie. Emperor Haile Selassie I also had an older daughter, Princess Romanework Haile Selassie, who was born from an earlier union to Woizero Altayech. Little is known about his relationship with Altayech beyond that it allegedly occurred when the Emperor was in his late teens. Because His Majesty never once mentioned any previous marriage, either in his Autobiography or in any other writings, it has been questioned whether there ever was a marriage. His daughter however was recognized as legitimate, as she was granted the title of Princess and given the dignity of "Imperial Highness" upon the Emperor's coronation along with his other children. Princess Romanework was married to Dejazmach Beyene Merid, and was the mother to four sons, two of whom survived to adulthood. Following the death of her husband in battle against the Italians, Princess Romanework was captured by the Fascists during the Ethio-Italian War and taken in captivity to Asinara Island off the coast of Italy, where she died in 1941. Her body was returned to Ethiopia and buried at Holy Trinity Cathedral. Her two surviving sons, Dejazmaches Samson and Merid Beyene were raised by the Emperor and Empress. The Emperor introduced Ethiopia's first written constitution on July 16 1931, providing for an appointed bicameral legislature. It was the first time that non-noble subjects had any role in official government policy. However, the failure of the League of Nations to stop Italy's invasion of Ethiopia in 1935 led him to five years in exile. The constitution also limited the succession to the throne to the descendants of Emperor Haile Selassie—a detail that caused considerable unhappiness with other dynastic princes, such as the princes of Tigrai, and even his loyal cousin Ras Kassa Hailu. Following the 1936 Italian invasion of Ethiopia from its colonies in Eritrea and Somalia, Emperor Haile Selassie I made an attempt at fighting back the invaders personally. He joined the northern front by setting up headquarters at Desse in Wollo province. The Italians had the advantage of much better and a larger number of modern weapons, including a large airforce. The Italians also extensively used chemical warfare and bombed Red Cross tent hospitals, in violation of the Geneva Convention. Following the defeat of the northern armies of Ras Seyoum Mengesha and Ras Imru Haile Selassie I in Tigray, the Emperor made a stand against them himself at Maychew in southern Tigray. Although giving Italian pilots quite a scare, his army was defeated and retreated in disarray, and he found himself being attacked by rebellious Raya and Azebu tribesmen as well. The Emperor made a solitary pilgrimage to the churches at Lalibela, at considerable risk of capture, before returning to his capital. After a stormy session of the council of state, it was agreed that because Addis Ababa could not be defended, the government would relocate to the southern town of Gore, and that in the interests of preserving the Imperial house, the Empress and the Imperial family should leave immediately by train for Djibouti and from there to Jerusalem. After further debate over whether the Emperor would also go to Gore or he should take his family into exile, it was agreed that the Emperor should leave Ethiopia with his family, and present the case of Ethiopia to the League of Nations at Geneva. The decision was not unanimous, and several participants angrily objected to the idea that an Ethiopian monarch should flee before an invading force. Some, like the progressive noble, Blatta Takele, an erstwhile ally of the Emperor, were to permanently hold a grudge against him for agreeing to leave the country. The Emperor appointed his cousin Ras Imru Haile Selassie as Prince Regent in his absence, departing with his family for Djibouti on May 2, 1936. Marshal Pietro Badoglio led the Italian troops into Addis Ababa on May 5, and Mussolini declared King Victor Emanuel III Emperor of Ethiopia and Ethiopia an Italian province. On this occasion Marshal Pietro Badoglio (declared the first Viceroy of Ethiopia and made "Duke of Addis Ababa") returned to Rome and took with him Haile Selassie's throne as a "war trophy," converting it as his dog's couch. At Djibouti the Emperor boarded a British ship bound for Palestine. The Imperial family disembarked at Haifa, and then went on to Jerusalem where the Emperor and his officials prepared their presentation at Geneva. Emperor Haile Selassie I was the only head of state to address the General Assembly of the League of Nations. When he entered the hall, and the President of the Assembly announced: "Sa Majesté Imperiale, l'Empereur d'Ethiopie," the large number of Italian journalists in the galleries erupted in loud shouts, whistles and catcalls, stamping their feet and clapping their hands. As it turned out, they had earlier been issued whistles by the Italian foreign minister (and Mussolini's son-in-law) Count Galeazzo Ciano. The Emperor stood in quiet dignity while the Romanian delegate, M. Titulescu, remarked to the President of the Assembly, M. van Zeeland: "For the sake of justice, silence these beasts!" The Emperor waited quietly for security to clear the Italian press out of the gallery, before commencing his speech. Although fluent in French, the working language of the League, the Emperor chose to deliver his historic speech in his native Amharic. The Emperor asked the League to live up to its promise of collective security. He spoke eloquently of the need to protect weak nations against the strong. He detailed the death and destruction rained down upon his people by the use of chemical agents. He reminded the League that "God and History would remember (their) judgment." He pleaded for help and asked: "What answer am I to take back to my people?" His eloquent address moved all who heard it, and turned him into an instant world celebrity. He became TIME Magazine's "Man of the Year" and an icon for anti-Fascists around the world. He failed, however, in getting what he needed to help his people fight the invasion: the League agreed to only partial and ineffective sanctions on Italy, and several members recognized the Italian conquest. Emperor Haile Selassie I spent his five years of exile (1936–1941) mainly in Bath, United Kingdom, in Fairfield House, which he bought. After his return to Ethiopia, he donated it to the city of Bath as a residence for the aged, and it remains so to this day. There are numerous accounts of "Haile Selassie was my next-door neighbour" among people who were children in the Bath area during his residence, and he attended Holy Trinity Church in Malvern (with the same dedication as Trinity Cathedral back in Ethiopia). The Emperor also spent extended periods in Jerusalem. During this period, Emperor Haile Selassie I suffered several personal tragedies. His two sons-in-law, Ras Desta Damtew and Dejazmach Beyene Merid, were both executed by the Italians. His daughter Princess Romanework, along with her children, were taken in captivity to Italy, where she died in 1941. His grandson Lij Amha Desta died in Britain just before the restoration, and his daughter Princess Tsehai died shortly after. Haile Selassie I returned to Ethiopia in 1941, after Italy's defeat in Ethiopia by United Kingdom and Ethiopian patriot forces. After the war, Ethiopia became a charter member of the United Nations (UN). In 1951, after a lengthy fact-finding inquiry by the Allied Powers and then the UN, the former Italian colony of Eritrea was federated to Ethiopia as a compromise between the sizable factions that wanted complete Union with the Empire, and those who wanted complete independence from it. During the celebrations of his Silver Jubilee in November 1955, Haile Selassie I introduced a revised constitution, whereby he retained effective power, while extending political participation to the people by allowing the lower house of parliament to become an elected body. Party politics were not provided for. Modern educational methods were more widely spread throughout the Empire, and the country embarked on a development scheme and plans for modernization, tempered by Ethiopian traditions, and within the framework of the ancient monarchical structure of the state. On December 13, 1960, while the emperor was on a state visit to Brazil, his Imperial Guard forces staged an unsuccessful coup attempt, briefly proclaiming Haile Selassie I's eldest son Asfa Wossen as the new Emperor. The coup d'etat was crushed by the regular Army and police forces. Upon returning he set about implementing more conservative policies, aligning Ethiopia with the West and distancing himself from the more common radical leftist African governments. The coup attempt, although lacking wide popular support, denounced by the Ethiopian Orthodox Church, and crushed by the Army, Air and Police forces, had gained considerable support among the students of the University and elements of the young educated technocrats in the country. It marked the beginning of an increased radicalization of Ethiopia's student population. In 1963 the Emperor presided over the establishment of the Organisation of African Unity with the new organisation setting up its headquarters in Addis Ababa. The increasingly radical student movement took hold in Addis Ababa University and high school campuses, and student unrest became a regular feature of Ethiopian life. Marxism took root in large segments of the Ethiopian intelligentsia. Resistance by conservative elements at the Imperial Court and Parliament, in addition to within the Ethiopian Orthodox Church, made proposals of widespread land reform policies impossible to implement, and also damaged the standing of the government. Outside of Ethiopia, however, the Emperor continued to enjoy enormous prestige and respect. As the longest serving Head of State then in power, the Emperor was usually given precedence over all other leaders at most international state events, such as the celebration of the 2,500 years of the Persian Empire, the summits of the Non-aligned movement, and the state funerals of John F. Kennedy and Charles de Gaulle. His frequent travels around the world raised Ethiopia's international image. A devastating drought in the Province of Wollo in 1972–1973 caused a large famine which was covered up by the Imperial government and kept from Haile Selassie I, who was celebrating his 80th birthday amidst much pomp and ceremony. When a BBC documentary exposed the existence and scope of the famine, the government was seriously undermined, and the Emperor's once unassailable personal popularity fell. Simultaneously, economic hardship caused by high oil prices and widespread military mutinies in the country further weakened him. Enlisted men began to seize their senior officers and hold them hostage, demanding higher pay, better living conditions, and investigation of alleged widespread corruption in the higher ranks of the military. The Derg, a committee of low ranking military officers and enlisted men, set up to investigate the military's demands, took advantage of the government's disarray to depose Emperor Haile Selassie I on September 12, 1974. The Emperor was placed under house arrest briefly at the 4th Army Division in Addis Ababa, while most of his family were detained at the late Duke of Harrar's residence in the north of the capital. The Emperor was then moved to a house on the grounds of the old Imperial Palace where the new government set up its headquarters. Later, most of the Imperial family were imprisoned in the Central prison in Addis Ababa known as "Alem Bekagn," or "I am finished with the world." On August 28, 1975, the state media reported that the "ex-monarch" Haile Selassie I had died on August 27, following complications from a prostate operation. His doctor, Professor Asrat Woldeyes denied that complications had occurred and rejected the government version of his death. Some believe that he was suffocated in his sleep. Witnesses came forward after the fall of the Marxist government in 1991, to reveal that the Emperor's remains had been buried beneath the president's personal office. On November 5, 2000 Emperor Haile Selassie I was given an Imperial funeral by the Ethiopian Orthodox church. The current post-communist government refused to give it the status of a state funeral. Although such prominent Rastafari figures such as Rita Marley and others participated in the grand funeral, most Rastafari rejected the event, and refused to accept that the bones unearthed from under Mengistu Haile Mariam's office were the remains of the Emperor. Among many followers of the Rastafari movement, which emerged in Jamaica during the 1930s under the influence of Marcus Garvey's "Back to Africa" movement, Haile Selassie I is seen as God incarnate, the Black Messiah who will lead the peoples of Africa and the African diaspora to freedom. His official titles, King of kings, Lord of lords, Conquering Lion of the Tribe of Judah and Root of David, are seen to be the titles of the returned Messiah in the New Testament Book of Revelation. The faith in the incarnate divinity of Emperor Haile Selassie I began after news reports of his coronation reached Jamaica, particularly via the two Time magazine articles about the coronation the week before and the week after the event. When Haile Selassie I visited Jamaica on April 21, 1966, somewhere between 100,000 and 200,000 Rastafari (or "Rastas") from all over Jamaica descended on Norman Manley International Airport in Kingston, having heard that the man whom they considered to be God was coming to visit them. When Haile Selassie I arrived at the airport, he refused to get off the airplane for an hour until Mortimer Planner, a well-known Rasta, persuaded him that it was safe to do so. From then on the visit was a success. Rita Marley, Bob Marley's wife, converted to the Rastafarian faith after seeing Haile Selassie I. She claimed, in interviews, that she saw scars on the palms of Selassie's hands (as he waved to the crowd) that resembled the envisioned markings on Christ's hands from being nailed to the cross—a claim that was never supported by other sources, but nonetheless, a claim that was used as evidence for her and other Rastafarians to suggest that "Selassie," as they refer to him, was indeed their Messiah. Rita's fervor for Selassie and the Rastafarian faith was what drew Bob Marley into the faith himself. Haile Selassie I had no role in organizing or promoting the Rastafari movement which for many Rastas is seen as proof of his divinity in that he was no false prophet claiming to be God. He was a devout member of the Ethiopian Orthodox Church, as demanded by his political role in Ethiopia. His publicly known views towards the Rastafarians varied from sympathy to polite interest. In order to help the Rastas and their aspirations of returning to Africa the Emperor donated a piece of land at Shashamane, 250 km south of Addis Ababa, for the use of Jamaican Rastafarians and a community of Rastas have remained there since. Many Rastas say that since they know Haile Selassie I is God, they therefore do not need to believe that he is God. Belief to them implies doubt, and they claim to have no doubts about his divinity. In the early days of the movement, he was seen as a symbol of black pride, and as a king for African people. The first Rastafari to appear in front of a court was Leonard Howell, who was charged with sedition against the state and its King George V of the United Kingdom. Howell declared himself a loyal subject not of the King of the United Kingdom and its Commonwealth, but of Haile Selassie I and of his country Ethiopia. When Emperor Haile Selassie I came before the League of Nations to plead his case only to have it rejected, this event confirmed their belief that the nations of Babylon, in reference to the ancient biblical place, will turn their backs on the messiah on his return. Many equated the Italo-Ethiopian war with the fight in the Book of Revelation between the returned messiah and the antichrist. 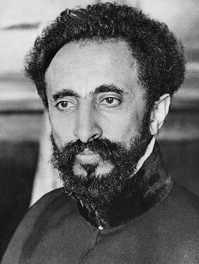 The Emperor's restoration to power in 1941 strengthened the Rastafari faith that he was Almighty God. The Rastafarians use his full name, Haile Selassie I, pronouncing the Roman numeral that indicates "the first" as the word "I", that being the first person pronoun, thus emphasizing the personal relationship they have with him; he is also called "Jah Rastafari Selassie I," and affectionately "Jah Jah". They are very proud of knowing and declaring that he is their God. They were never concerned that Haile Selassie himself did not claim to be God, saying that the real God would never claim to be so just to get worldly acclaim and power. Roots reggae is full of thanks and praises towards "Selassie I". They believe Haile Selassie I will one day initiate the day of judgment, calling the righteous and the faithful to live with him forever on a new Earth ruled from Holy Mount Zion, which is said to be a place in Africa. Rastas believe that Haile Selassie I is still alive, and that his purported death was part of a conspiracy to discredit their religion. In addition to being a political and historical figure, Haile Selassie I has become a popular culture symbol through the Rastafari movement. Many Rastas are concerned that the world does not see Haile Selassie in a positive light due to negative and unproven rumours about large bank accounts that the Marxist government in Ethiopia claimed he had used to salt away the wealth of the country. Selassie's core beliefs of racial integration, a united Africa and the following of a moral path are at the heart of Rasta philosophy. ↑  Appeal to the League of Nations, 1936. Retrieved September 19, 2007. ↑ Chicago Tribune, June 24, 1973). Interview with Oriana Fallaci. ↑ Selassie, Haile, "One Race, One Gospel, One Task," address to the World Evangelical Congress, (Berlin, October 28, 1966). The last of the Ethiopian emperors BBC. This page was last modified on 25 July 2017, at 21:05.